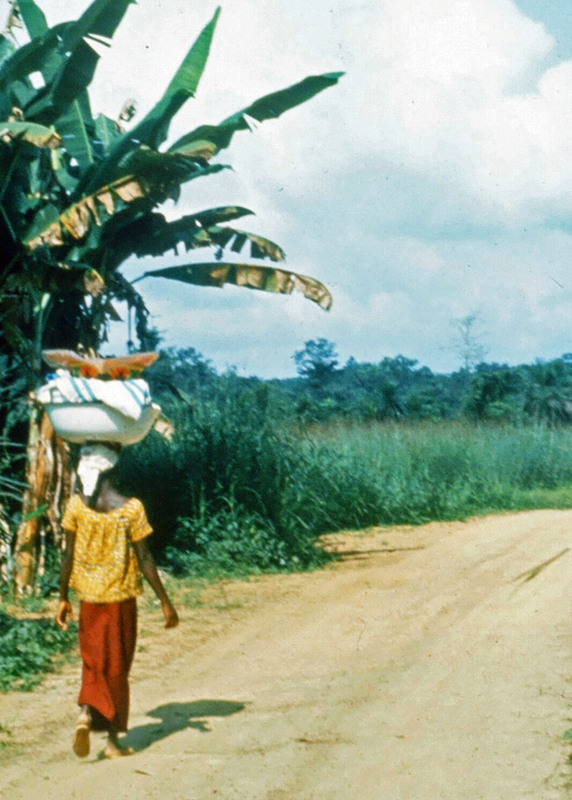 Women in Gbarnga carried produce to and from the market on their heads. It was very graceful. Banana trees are growing on the left. Gradually, we settled into a routine. By one in the afternoon, we had finished with another day of teaching and assigned it to the done pile. PB&J washed down by orange Kool-aid rewarded our success. Sam joined us. We bought the jelly and peanut butter from the Lebanese market. The bread came from the local baker. Occasionally it included bug parts. We looked before we bit. Nap time was next; I fell in love with siestas. Rainy season helped. Torrential afternoon showers pounded down on our zinc roof, cooled the air, and lulled us to sleep. An hour later we rolled off the bed and jumped into lesson planning. Monday through Friday Sam cooked Liberian chop for the three of us and on Saturdays Jo cooked Kwi food (western food) for him, usually pasta of some type. He had a teenager appetite and our budget was tight. Sam was off on Sundays. Chop consisted of a thick soup made up of meat, greens, hot peppers, bouillon, tomato paste and palm oil. It was served on top of country rice, the staple crop and food of the Kpelle. The rice was raised on the hillsides as opposed to in swamps and arrived with small stones that Sam carefully picked out. The nearest dentist was in Monrovia. If you let him near your mouth he would find 15 cavities you didn’t have. Peace Corps paid well. The meat might be beef, chicken, fish, goat or even pork, but we usually opted for Argentine canned beef. Fresh beef required a six am trip to the market on Saturday. We knew it was fresh because the butcher carved it off a still quivering carcass that had been a live steer an hour earlier. You pointed at the cut you wanted. Anything without bone was steak. It was not marbled in fat. Liberian cattle were rib-showing skinny and fed off of any grass they could hustle. We sacrificed the meat to an old-fashioned meat grinder and cooked it to death. Our experience with Gbarnga’s butcher convinced us that canned beef tasted really good. The greens for our chop came from Gbarnga’s thriving open-air market. Collards, potato greens, eggplants, pumpkins and bitter balls were our options. Bitter balls tasted exactly like their name: eating them one time was once too many. The number of peppers thrown in depended on tolerance for hot. We progressed from being one-pepper-people to three-pepper-people during our stay. Palm oil added a unique, almost nutty taste. The market was filled with tribal women selling everything from palm oil to large snails that constantly escaped from their tubs and crawled off. ‘Small boys’ were sent to retrieve them. Sam refused to cook the fist-size Gastropods. 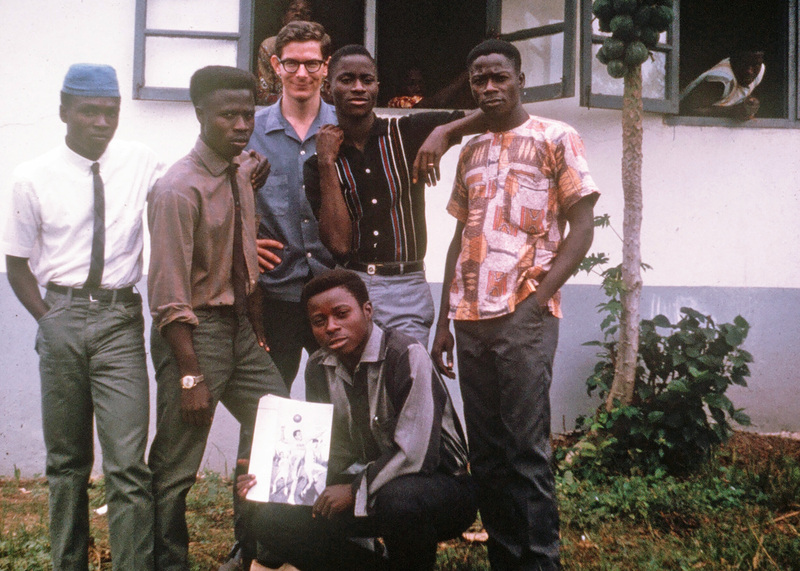 “They are taboo for my family.” Taboo was a word he had learned from an anthropologist. I wasn’t sure about the taboo part but hung in with him. I had no more desire for dining on the slimy creatures than he did. Produce was carried to market in large metal bowls that the women balanced on their heads with ramrod backs and ballerina grace. Given enough beer, I wandered around our house trying to master the procedure. Five seconds were my record before everything came crashing down. The women wore brightly colored lappas with blouses and headscarves. They would squat next to their produce and call out prices. Large, juicy oranges were “one cent, one cent” in season. Grapefruits were “five cent, five cent” and giant pineapples a quarter. Avocados or butter pears as the Liberians called them could also be purchased for a few cents. The oranges sported green skins and the pineapples ant nests but both were “sweeto,” as my students liked to say. We added orange juice to our orange Kool-aid. Plopping the pineapples into a bucket of water over night did in the ants. By morning they were little black floaters, forming a scum on top of the water. Our appearance at the market caused inflation but bargaining was expected. We took along Sam whose rapid Kpelle assured everyone got a fair deal. Eventually Sam took over the shopping chores. We’d send him off with five dollars and he would bring home a week’s worth of food. When dark arrived in it’s efficient tropical fashion, we would light our kerosene lantern and get cozy. Peace Corps supplied each Volunteer with a book locker filled with one hundred books. We considered it our responsibility to read them all. TV was not an option. I was curious about who made the book selections. My money was on a Harvard professor of literature. The book lockers were heavy on classics and short on mysteries and Sci-fi. Occasionally we would add a game of scrabble or cards to our evening routine. Around 10 PM it was time for us to eliminate any cockroaches that had strayed into our bedroom and drift off to dreamland. The Sassywood Man, a tribal judge in rural Liberia, obtained his name through use of a poisonous drink infused from the bark the Sassywood tree. The accused person was invited to take a sip. If he died, he was guilty. No DAs, lawyers, judges or juries were required. Since modern society frowned upon trial by survival, the Sassywood Man had come up with new ways of determining guilt. As it turned out, the father of one of my students was the local tribal judge and my ex-wife and I were privileged to witness an actual trial. It started with Amani coming to our house at two in the afternoon on a blistering hot Saturday in the middle of the dry season. His father was about to start a trial. Would we like to see it? Absolutely, there was no way we would miss the chance. As we trudged east across town through the dust and stifling heat, Amani provided background information. The plaintiff’s wife had come home in the evening after a hard day of selling oranges at the market and told her husband that three men had accused her of not wearing underpants. This was serious slander. The husband had filed charges against the men through Liberia’s western-type court system. But there was a potential glitch: what if the men knew something about his wife’s behavior he didn’t? Perhaps his wife was lying to him. If he lost the suit, he would have to pay all of the court costs plus he would be subject to countersuit. He decided to hedge his bet by taking his wife to the Sassywood Man first. If he found she was lying, the husband would drop the charges. We arrived at court (a round hut) and were rewarded with front row dirt seats. Jo and I asked Amani how to address his father and he told us to call him Old Man, a term of respect. So we did. Old Man didn’t speak English and we didn’t speak Kpelle but there was much smiling and finger snapping. We were delighted to meet him and he was equally delighted to meet his son’s teachers. After the greetings were complete, Old Man began preparing for the trial. The first thing he did was to ignite a roaring bonfire, just the thing for a hot afternoon. About this time the husband arrived sans wife. ‘Being brought,’ it turned out, was a conservative description of the process. She was being dragged and appeared ready to bolt at the first opportunity, which she did. The woman was half gazelle; my greyhound of childhood days couldn’t have caught her as she leapt off down the trail. For everyone involved, it looked like a clear case of guilt. But the trial was still going to be held. I asked Amani if it was being carried on for our benefit but he explained it was legitimate for the husband to sit in for the wife. Next Old Man arranged his magic objects and proceeded to mumble over them like a priest preparing for Communion. Once the appropriate spirits had been called, it was time for mystery liquid. A generous amount was rubbed on each Sassywood leg. We were ready for the truth. He took the “knife” and rubbed it down his leg. It sounded like a T-bone steak cozying up to a hot grill. But Old Man grinned. The knife was cold. The husband was next. His leg appeared much less optimistic. It was, in fact, preparing to follow his wife’s legs lickety-split down the hill. Only a firm glare from Old Man made it behave. The machete sizzled its way down the shinbone and a look of surprise filled the husband’s eyes. The knife was cold; the woman was lying. “Ow!” he yelled and jumped back as the machete appeared to graze his leg! The knife was definitely, absolutely, beyond the shadow of a doubt, hot. This time Old Man couldn’t even get near the husband’s leg since the husband had cleared about ten feet from a sitting position and was strategically located behind a tree. The jury had returned its verdict; his wife was lying and he would drop the charges. He didn’t need his leg torched to prove the point. NOTE: Before writing this blog, I looked up Sassywood on the Internet. Only recently has Liberia ceased issuing licenses for Sassywood Men and apparently several people were killed in 2007 while undergoing trials by drinking Sassywood tea.